I have to admit something sort of strange about me. I get highly anxious around crowds, but not all crowds. I can very easily attend a Texas A&M football game where over 100,000 people are present, but going to the shopping mall on a busy day completely stresses me out. The frenzy and the crowd is not much different, yet I still can easily do one and stress out over the other. I have tried to rationalize this and the only thing I can figure out my comfort with uncertainty. At the football game, I know where I am going, where I will be sitting (or standing the whole time), and I am very accustomed to the traditions. At the shopping mall, however, there is uncertainty. I believe it is the uncertainty that completely stresses me out. Will I find a parking spot? Will I find what I am looking for? How long will this take? How much will this outing cost me? These are the questions that are floating around my head as I approach the busy shopping mall. This Sunday’s scripture we will be reading about the calling of the first disciples. They are out doing what they are comfortable doing, but are having very little success. The first disciples were fishermen and had spent their whole lives learning the trade. On this particular day, they were having very little success. Jesus recognizing their unsuccessful fishing outing suggests they throw their nets back in the water and try again. Imagine what it must have been like for a skillful fisherman to have a carpenter come up and tell them how to do their job. It would be like me telling my mechanic when they are unable to fix my car to try again. I may have some experience in the matter but probably not as much as the mechanic who has been trained in that area. Simon Peter appears to me to be bothered by the suggestion but does as Jesus says and throws them back in. What happens next is a miracle. It may not be as amazing as many of the other miracles, but nonetheless a miracle. Skilled fishermen are unable to do what they were called to do, but divine intervention steps in and changes things. What happens next is the most bizarre part of the story. Jesus, after showing the first disciples his ability to do the miraculous, calls them to give up the trade they were raised to do and most comfortable with, to follow him and become fishers of men. Certainly being a fisherman was a stressful job, but being called to something you had never been prepared for must have been even more stressful. I believe this is the call for the church today. We have been going about our business, as usual, doing the things we are comfortable doing, but with very little success. Attendance in church services by younger age groups is in severe decline. I don’t believe it is because we are not good at doing what we were raised or trained to do, but that we do what we are comfortable with. We are being called to take risks and go in directions we have never before adventured. We may be unprepared, but like the disciples, we are not alone. When Jesus called the first disciples, he didn’t ask if they were ready but instead told them to not be afraid. 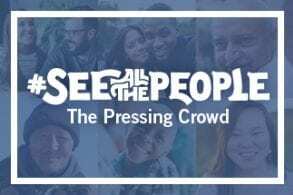 This Sunday, 2/10/2019, we will be continuing with part 2 of #SeeAllthePeople campaign from last year. We will explore what it means to face our fears and meet people in the crowds. Join us at 9:30 AM for Sunday School and 10:30 AM for worship as we explore what it means to Press the Crowds.